Manager and Head Coach of JO, Xcel and Rec. 8 years of coaching experience. The C in ABC's. Courtney has been coaching for 8 years and works developmental, compulsory levels and optional level gymnast. Courtney is a USA Gymnastics Safety Certified coach and has attended congress 7 years in a row, two of which were Nationals. 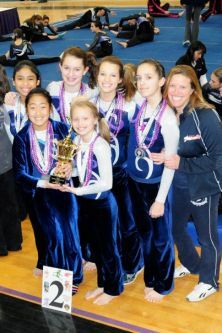 She has coached kids who have received local and national first place titles in all around and individual events. She has a strong desire and ability to teach gymnastics. Courtney competed up to Level 9, was a Level 5 All Star Cheerleader, and was on a Celebrity cheer team that won first place at Worlds in 2010. As a gymnast, cheerleader, and dancer she has placed first in many competitions throughout the US. Courtney's love and passion for teaching and gymnastics have made her a very popular coach. Courtney has coached many girls who won state and regional competitions. Courtney is a great choreographer and dancer and choreographs many optional level routines. Courtney graduated from the University Of Connecticut in 2016 majoring in Communication and Business. She is USA Gymnastics Certified & U100. 9 years of coaching experience. Eve has been teaching gymnastics for 9 years and really loves coaching all levels of gymnastics. She has gone to USA Gymnastics congress for 7 times for extensive training. She attended the USA gymnastics training sessions in Florida for the new USA Gymnastics routines and rules for 20013-2019 in June of 2013. Eve has been coaching xcel and compulsory teams for over 5 years. She has produced Xcel State Champions. She is great with the kids and is always on top of the list of most wanted coaches. Eve was a gymnast and cheerleader herself. Eve is our head Xcel coach here at ABC'S coaching recreational classes, Xcel Bronze, Silver, Gold and Platinum. She is USAG Safety Certified, CPR and First Aid Certified, and U100. 18 years of coaching experience.Maggie has been teaching gymnastics at ABC's since 2006. She was a competitive and recreational gymnast for over 14 years and previously taught gymnastics throughout her college years. Maggie was a Designer and Merchandiser in NYC for several years before taking time off to have children. Now that her son and daughter are school-age, she is back teaching the sport that she loves. Maggie enjoys working with children of all ages. Children and parents love Maggie's teaching techniques. Maggie is a highly trained and accomplished coach. Maggie coaches Xcel and compulsory gymnasts as well as recreational classes. She is both CPR and First Aid certified, USA Gymnastic Certified, and U100. 15 years of coaching experience. Russ has been coaching at ABC's since 2001. He loves to teach kids of all ages. Some say he has the patience of a saint. He started his teaching career in college as a ski instructor at Stratton Mountain where he taught skiing for 10 years. His psychology major has helped him understand the needs of today's children. Russ is our head boys coach and teaches recreational classes along with working the front desk. Russ is USAG Safety Certified and both CPR and First Aid certified. Russ is USA Gymnastics certified and U100. Melanie started coaching at ABC in 2015 and has been a very desirable coach at ABC. She is a highly requested coach during registration. She is currently finishing her Nutrition Degree at the University of Connecticut. Melanie did gymnastics and dance growing up and always has had a deep passion for working with kids. Melanie coaches recreational, Xcel and developmental classes. Her favorite group to coach is the Mini Stars and Walkers where she teaches and encourages toddlers at a young age to grow to love the sport as much as she does. She has attended congress the past two years where she furthered her education in gymnastics. Jacquelyn has been coaching at ABC-Shoreline Gymnastics for over 11 years. She is a USA Gymnastics certified Junior Olympic Development coach and has completed the USAG U100 course as well as many other trainings offered by USAG. She also has four years of experience as a USA Gymnastics Judge for Levels 4-6. Growing up, Jackie competed in gymnastics for 10 years, reaching Level 9. She participated in both USA Gymnastics and “Y” meets, representing her club in State and Regional competitions in all events. After gymnastics, she switched sports and ultimately competed hurdles, jumps, sprints, and relays throughout college, reaching Nationals in the 100-meter hurdles. Over the years, Jacquelyn has coached track and field and cheerleading in addition to gymnastics. She loves to teach and share her passion for the sport of gymnastics with young athletes, and she looks forward to working with each child to reach his/her full potential. Jackie coaches recreational, Xcel and compulsory levels along with optional gymnasts. Most days you’ll find her flipping around before or after practice! Ashley is currently pursuing her degree as Physician Assistant at Florida Gulf Coast University and Coaches summers and breaks when she can. 4 years of coaching experience. The A in ABC's. Ashley has taught gymnastics for 4 years and grew up in the gym. Ashley was a level 9 gymnast, and dance team and level 5 cheerleader, but she had to end her career early due to a back condition she was born with. Ashley is known for her unbelievable dance moves. She is a great choreographer and teacher. Ashley has choreographed all levels as well as high school routines. Ashley is your go-to person when you need answers on the upper level and high school gymnastics rules. She is an honors student and was president of her class for 3 years in high school. Ashley is an excellent leader and teacher. She loves kids and is very patient with them. Ashley teaches recreational classes, developmental, Xcel, and compulsory levels. She is great at teaching class kids, team kids, and dance. Ashley is also life guard certified, CPR and First Aid certified, USA Gymnastics Certified, and U100. Christa is the Head Coach of our Montville Park and Rec program. Christa did gymnastics through High School and competed for East Lyme High School. She loved High School Gymnastics so much that she is now the assistant coach of ELHS team. 30 years of coaching experience. She is a CT State All Around High School Gymnastics Champion. 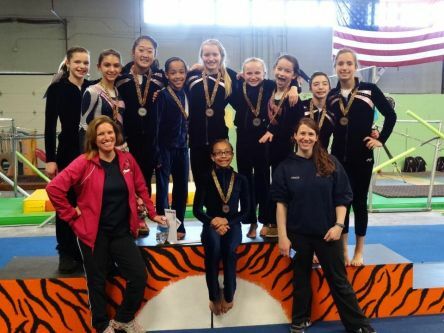 At the end of her freshman year she began her elite gymnastics training with three-time Olympian Muriel Grossfeld in Milford, CT. Muriel is presently a leading National Olympic Staff Official. After competing at the USA National Elite Level of Gymnastics, she received a full gymnastic scholarship at The Pennsylvania State University and graduated in 1984. Linda owned and operated Flip City Gymnastics for eighteen years. She competed at the Gymnastic National Elite Level I, competed at the World Game Trials, trained for the boycotted 1980 Olympics, and represented the United States against other countries such as the Peoples Republic of China, West Germany, England, & Japan. Linda coached many gymnasts to become State, Regional, and National Champions. Linda is USA Gymnastics Certified, Level 4/5/6 through Brevet Judging Official and Certified High School Judging Official, USA Gymnastics Professional Member, CIAC Membership, NAWGJ National Association of Woman’s Gymnastic Judges, USA Gymnastics National Safety Certification and Skill Evaluator, USA Mentor to Annia Hatch, 2004 Olympic Silver Medalist. 2007 Recipient of the Connecticut AAU Gymnastics Lifetime Achievement Award and The Connecticut AAU Governors Award in recognition of outstanding dedication to the Connecticut AAU Association’s Goals and Principals.